Celebrate 6 Years of Rock N' Reel Grrrl Power! Thanks to our generous Teen Rock Camp sponsors & supporters!! Thanks to those who helped us launch our first Film Camp for Teens!! Our biggest show yet!!! 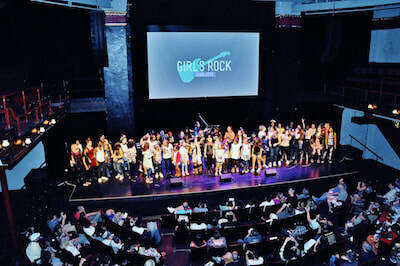 Six teen bands rocked the stage and 3 short films premiered!! Our first teen film camp launched right alongside our growing teen rock camp program. A week and show full of GRRRL Power! Our 2018 Kids Camp was full of energy, music and fun!! Over 30 campers (many for the first time) rocked the stage - writing amazing songs, bonding with their bands and learning to use their voice!! We can't wait to watch them rock with us for many years to come! ​Our first ever "Kids Camp" rocked our faces off! Thanks to the support from the Arts & Science Council and their Cultural Vision grant award we were able to launch this summer camp with huge success! Six bands of campers ages 8-12 (for most...it was their first time playing!) wrote original songs and rocked the house. We can't wait to watch these rockers grow over the years! ​Our first ever "Teen Camp" rocked it this year! We had 6 bands of 30 campers take the stage and rock the house. Their songs were AMAZING!! Many of our campers were return rockstars, while we also welcomed some new teens to the family. Half of our campers received Scholarships from our "Help Us Rock Scholarship Fundraiser." ​Our summer camp program and concert was a huge success! Seven bands with 35 campers, 30+ volunteers and awesome community leaders helped us rock a house of almost 500 people!!! Our biggest camp yet! Next year...we grow to two weeks! We will offer a kids camp and a teens camp. Stay tuned! ​SO MUCH THANKS AND GRATITUDE TO OUR 2016 SUMMER CAMP CONCERT PRESENTING SPONSOR BANK OF AMERICA!! Click here to watch how we rocked 2016!!! ​In 2015, we grew from four bands to six for the week! Hosted by the Blumenthal Performing Arts Center in Spirit Square, our campers rocked the McGlohon Theater with an awesome concert for a full house of smiling families and rocking supporters. We had a great team of volunteers and a generous list of supporters who all helped to make this week truly inspiring for all! A rockin' 2015 Summer Camp Concert at the McGlohon Theatre!! 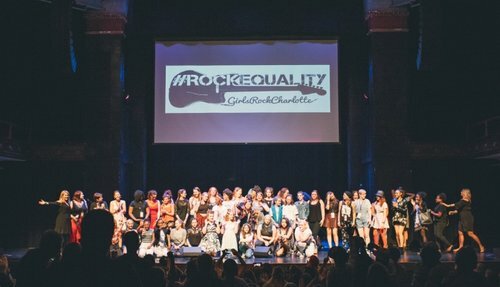 Our first Girls Rock Charlotte summer camp was a huge success. We thought we were "starting small" but that changed as campers, volunteers and amazing community supporters all signed up to make 2014 a rockin' year! A special thanks goes out to Krystle Baller (who first found us on Facebook and has since become our Music Program Co-Director!) for putting together these videos featuring 2014 highlights and concert performances.